CLEVELAND, Oct. 1, 2013 /PRNewswire/ — A new study, B2B Content Marketing: 2014 Benchmarks, Budgets and Trends—North America, has been published by the Content Marketing Institute and MarketingProfs. This report, sponsored by Brightcove, shows that 93% of B2B marketers in North America are using content marketing. Of those, 42% consider themselves effective at content marketing, up from 36% last year. Not only are marketers feeling more confident, but they are continuing to invest in content marketing in terms of budget and time. 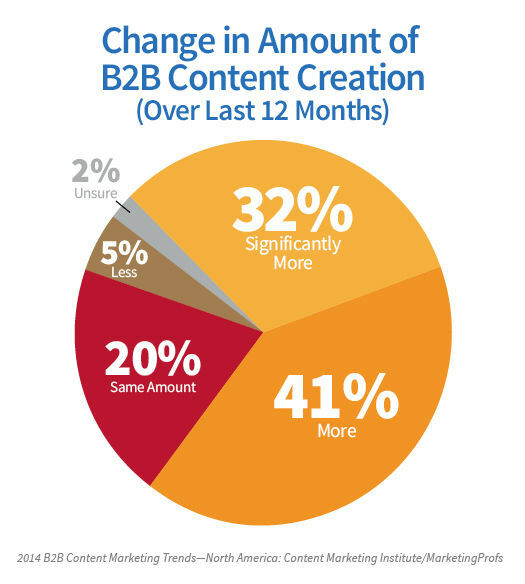 On average, B2B marketers allocate 30% of their budgets to content marketing. Fifty-eight percent of marketers plan to increase content market spend over the next 12 months. Seventy-three percent of respondents are producing more content than they were a year ago. Compared with last year, marketers are using more content tactics (13 compared to 12) and more social media platforms to distribute content (6 compared to 5). 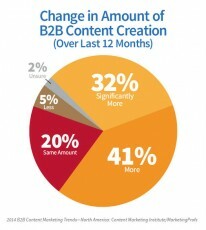 B2B Content Marketing: 2014 Benchmarks, Budgets and Trends—North America reports on the findings gathered from the fourth annual Content Marketing Survey conducted by the Content Marketing Institute and MarketingProfs. The research was sponsored by Brightcove. More than 1,200 B2B marketers in North America from diverse industries and a wide range of company sizes responded to the survey in July and August 2013. The full report can be downloaded here. MarketingProfs (www.marketingprofs.com) is a marketing education and training company that offers actionable know-how designed to make you a smarter marketer. More than 600,000 MarketingProfs members rely on our free daily publications, virtual conferences, and more to stay up-to-date on the most important trends in marketing—and how to apply them to their businesses.